The Liberator Wedge Ramp Combo is the perfect combination of support and comfort. Teaming up these two expertly-crafted positioning shapes will revolutionize your life and allow you to experience a variety of new positions while inspiring you to find your own. The ergonomic design and flexible versatility will give you more sensitivity and greater stamina for longer sessions that will yield incredible results. Original Size measurements: Ramp is 34"L x 24"W x 12"H. Wedge is 14"L x 24"W x 7"H. Original Size recommended for those over 5'8". Short size also available. Slanted positioning pillows allow for limitless positions and are designed to work together or apart for even more variety. 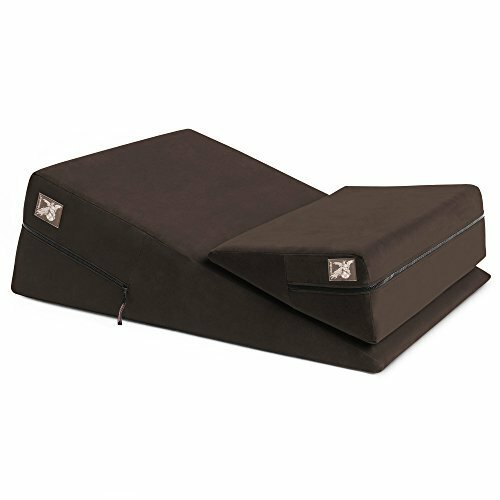 Creates comfort and support to take weight off knees, backs, and necks while providing the perfect angle. High-density foam supports the body and prevents sinking into a bed or couch while offering angles and access for maximum satisfaction and relaxation. Removable, machine-washable microfiber cover feels soft against skin and a moisture-resistant liner protects foam. Delivered vacuum compressed in eco-friendly packaging. Ramp is 34"L x 24"W x 12"H. Wedge is 14"L x 24"W x 7"H. Made in the USA by Liberator.